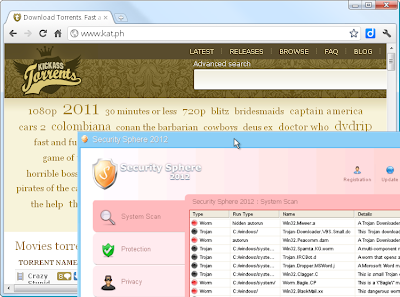 A Famous Torrent website's(alexa Rank:321) KickAssTorrents(kat.ph) OpenX platform compromised, and served a fake antivirus "Security Sphere 2012" through malvertising(stands for malicious advertisement),detected by armorize.When the user click the ad, it will redirect to fake page. This page infects users without their knowledge. Our users that are using the Avast anti-virus might have noticed that KAT.ph suddenly became labeled as a dangerous website for users that are not logged in. We want to assure our users that KickassTorrents has no malware or viruses of any kind and it is absolutely safe to use our website. We already contacted Avast and currently we are trying to find and fix the cause of this problem. You will help us if you choose the "Report the file as a false positive" option if you get the alert. Now what the hell does this error mean? First of all, don't flip out, don't go post on the KAT site, post down here if you experience the same problem. Secondly, report down here if you experience this error. Thirdly, add kat.ph to the safe URLs in your AV. Back on topic. What is this error? Does error roughly means that your anti-virus software has found some bad code in an iFrame. This could be from the site itself, or from advertisements. An iFrame is a piece of code that allows you to do several things. Embedding something to your site is a good example. I hope this topic helps a little and I certainly hope the error is going to be fixed now. Q: OMFG IS KAT HACKED? A: Nope, just some error. Q: Is it really safe to visit KAT? It should be solved, if not let us know please. Well, that time it might have been a false positive from Avast, but this time the website is absolutely infecting its visitors, as seen in our video. At the time of detection , only 2 out of 42 detected the malware in virustotal analysis. According to Armorize,this attacker is responsible for speedtest.net incident. The new dyndns domain for the next hour is generated every hour precisely at minutes 2 to 5, so this may be done by an automated mechanism. All generated domains resolve to a single IP: 184.22.224.154 (AS21788, United States Scranton Network Operations Center Inc), located in the US. The domain: obama-president.com resolves to this IP and is serving the same exploit pack. This domain was registered on Aug 4th through an Russian registrar, 1'ST DOMAIN NAME SERVICE www.1dns.ru. At this time the domain resolved to an Netherlands IP 85.17.93.9. The domain started to resolve to 184.22.224.154 on Aug 23rd. This IP and the president-obama.com domain are both currently still up and working.